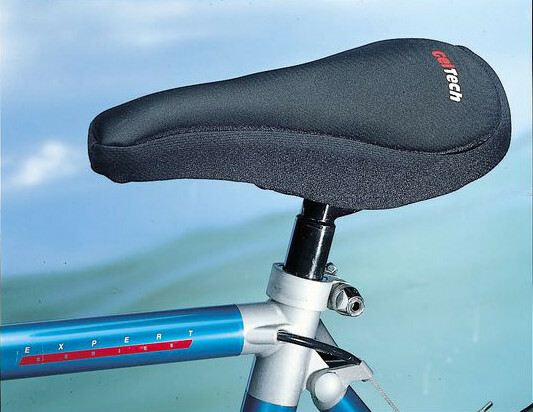 Gel Bicycle Saddles Cover unobtrusively puts a 1.5in, 3.8mm gel pad between you and the saddle. One thing they do not tell you about going to cycling and spinning classes is that the saddle pushes into your delicate parts and can be highly uncomfortable even painful. Even on a relaxed ride the pressure is on, never mind distance cycling or an hour or more spin class. OK, so you take the soft Neoprene and genuine DuPont Lycra topped cover and stretch it to fit over your or the gym spinning bike saddle and pull a drawstring tight to stabilise. Then you cycle or enjoy your spinning class as usual. Only that 1.5in 3.88mm pad is protecting you, moulding to your body, and making the ride way more comfortable. As well as the pressure being taken off your nether regions you may notice the gel is cool when things are heated and warm when things are cool. If you need to, when done, release the toggle, loosen the drawstring and remove. Gel Bicycle Saddles Cover makes a great cycling gift and is ideal for road cycling as well as spinning classes and kit for a race or event, it may also save many having to buy a whole new bike saddle part. Gel Bicycle Saddles Cover text, images and video are copyright.